Some of you may recognize my name and others may not, but please allow me to introduce myself- I’m Beth, Kristeen’s assistant and studio manager. I am the person working behind the scenes for Kristeen. I help her coordinate her schedules, stay on top of her email inbox, work with clients to design albums and canvas prints, and other special projects that Kristeen needs done while she is trying to multitask being a top Indianapolis photographer, a fantastic momma, and a wonderful wife! While I was a bit scared when Kristeen told me that she wanted to switch client management softwares (knowing that this was going to be a great deal of work for me, lol) I cannot tell you how happy I have been with the entire process and how thankful I am that we are now working with Dubsado. I wanted to take the time today to share with you some insights on how this has impacted my work with Kristeen, us as a company, and you as the client! If you are a past client and have booked a session with Kristeen lately, you may have noticed that the emails and client invoices look a little different. This is because we recently switched over to new client management software called: Dubsado. For many years, we were using software called ShootQ, and while it met a lot of our needs, there were many different aspects of the client experience that we wanted to improve upon and in this digital age, ShootQ just really was not keeping up. Before switching to Dubsado we did a lot of research on the best CRM tool for the job. There are a surprising number of tools out there for photographers. We looking into Honey Book, Iris, Studio Ninja, and a few more. There were a lot of good tools out there. Some of them do some things better then others. However, we were looking for something that was strong in terms of client communications, low payment processing fees, completely customizeable contracts for clients, a branded client experience, and easy to use for both us (as the business owner and our clients). Dubsado checked all the boxes here. Something that I also love about it is that Dubasdo is constantly being updated with new features. Unlike ShootQ I don’t have to transition to a new software in order to get new features. Moving to Dubsado was a huge investment in terms of time and energy but I’m confident we made the right decision for the business. 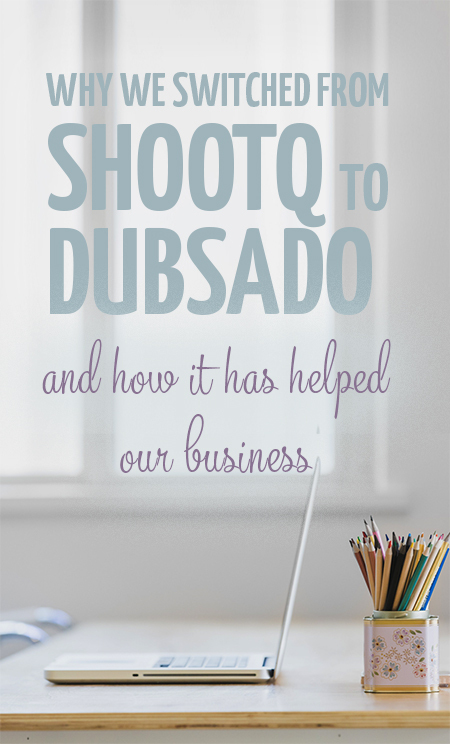 We wanted to take the time to share with you the top five reasons how switching from ShootQ to Dubsado has helped our business. The layout is pleasing to the eyes. When using previous software, we would have to go back and forth between different screens to see all of the information that we needed in order to correctly correspond with a client. In Dubsado, our chain of emails with the client are all in the same place and we do not have to use the back button to move to and from different emails. Help is always a button click away. The people that work at Dubsado are always just a button click away, and most of the time it only takes as long as it takes to type my question to get an answer. The answers are very thorough too and if for some reason they are away from the helpdesk, it shows me an approximate time when they will return and respond to my question or request. Mobile Friendly Website. While I am going to be over the moon excited when Dubsado releases an app, if I really get into a bind and I need to respond or send something to a client before I get back to my laptop, I can log on to Dubsado from my phone and the mobile version of the site is pretty user friendly. It is easy to navigate and I always know where I am going and what I am trying to do; and can get it done in a jiffy. This is also very helpful for clients that need or want to respond to emails, sign contracts, view or pay an invoice on the go as well. The possibilities are endless. Even though we have only been a subscriber of Dubsado for a few short months, we feel like each month, the site and the features keep getting better. They are also continuing to partner with other sites and integrate more components into the website as well. When a company tells you that changes are on the horizon and then keeps telling you that week after week and month after month, with no changes being seen, it gets old really fast. Dubsado sticks to their word! All in all, we have been very happy with the transition and switch from ShootQ to Dubsado. We hope that this has increased your client experience with KristeenMarie Photography as well because well, we want nothing but SPECTACULAR customer service for our clients! If you are a photographer and looking into different photographer CRMs you should really consider Dubsado! They are constantly improving and updating their system and I can’t say enough good things about them. Check out Dubsado here – you won’t regret it!! If you do end up checking it out feel free to use my referral code for 20% off your first purchase. The code is “kmphoto”. Thanks! Glad you found this helpful. Happy shooting (and business organizing! ).